UC browser is the top most browser and it is using by million of people around every android user who are spent their time on downloading. Sometimes downloading stopped and not resume again and it shows a message Retrying (1), retrying (2), retrying (3) , retrying (4), retrying (5)……..this is very big problem in this browser in a case of android smartphones, there is a working method to Resume UC Expired/failed/dead Download Links . Goto File Manager > UC Downloads > Then Find Your Downloading File And .tmp File Just Below Your Downloading File. Now We Have To Move Those Files From UC Downloads Folder To Any Other Folder. Then again we Need to Open UC Browser App And we’ve to delete file from Downloading Files. Now We Have To Download the Same File Again From The Same Link For A Minimum Of 2-5% and pause it. Now Goto Folder Where You Moved First Two Downloading Files And Move Them Back To UC Downloads Folder. 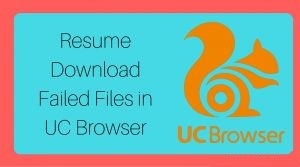 Now open UC browser app again and goto Download Manager and Resume Your Download. Note:- This trick is only work resume supported link, it doesn’t work with “Resume Not Supported” files.